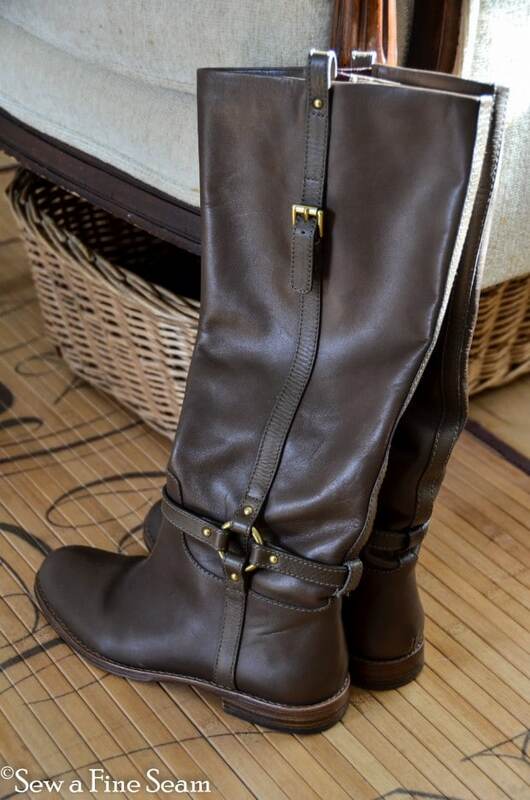 I love boots and wear them most of the winter. I basically go from flip-flops all Summer to boots in the Fall/Winter and back to flip-flops in the Spring. There are a couple of weeks in Spring and Fall that I wear shoes with toes and heels but most of the year I’m in boots or flip-flops 😀 When I’m not in my house that is – in my house I go from barefoot to fuzzy socks. I’ve worn the same pair of black boots for years now. I also have a pair of full grain leather UGGs that I wear when it is really really cold. I’ve worn them more this Winter already than ever. In October when we went on our trip to Wisconsin I wore my black boots. I took one pair of shoes along but never wore them – it was the boots only. Soon after we left home I realized that the heel cap of one boot was loose. Last winter I glued them both on with E6000 glue as they both decided they had done their job long enough. This winter one came back off and I re-glued it. It didn’t last and I repeatedly shoved the heel cap back on when it would work its way off. After arriving home from vacation a new pair of boots was at the top of my list of things to shop for. And I found a pair I really loved. At Nordstrom Rack. Still pricey but just under the top price I was allowing myself. Full-grain leather. Leather lined. Leather soles. 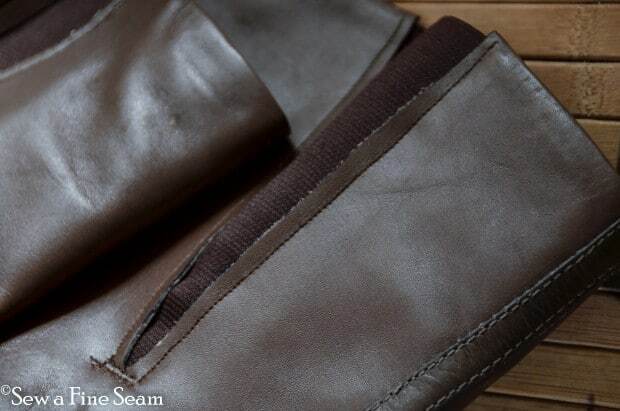 They had to be leather – the sole is negotiable but the lining HAS to be leather. My hubby is a leather snob and he’s pretty much converted me. I rarely buy myself footwear that isn’t leather. The gentleman who works in the Bootery now was wonderful. I told him what I wanted and that I thought I could possibly do it myself if I could get the elastic. He looked at me with a small smile and wanted to know how I was going to go about accomplishing my goal. He listened attentively, nodding and smiling slightly. He then went to his work space and pulled out a couple different sizes of elastic to use for gusseting. We decided the wider one would work best, he determined how much length I would need and cut the elastic. He told me he thought I knew what I was doing, charged me $4 for the elastic and sent me on my merry way! And since I decided to do the job myself I thought I’d show you how to add an elastic gusset to tall boots. You’re welcome. I cut just a very tiny bit of a strip of leather out, just to even my cut a bit. 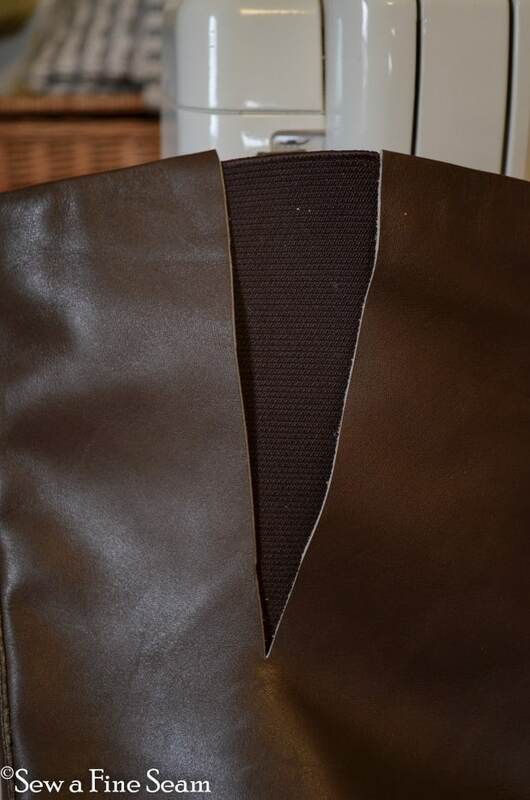 Basically I just let the leather spread apart and slipped the elastic between the outer leather and the leather lining. Sewing the first side of the elastic wasn’t too bad. I had to work it a bit and go slowly, and I had to make sure the leather and the lining stayed where they should on the elastic piece as I went because I didn’t want to put pins through the leather. I found it helpful to use tailor’s chalk (any fabric marking pencil will work) to mark on the elastic where the edge of the leather should be when I laid it out flat. 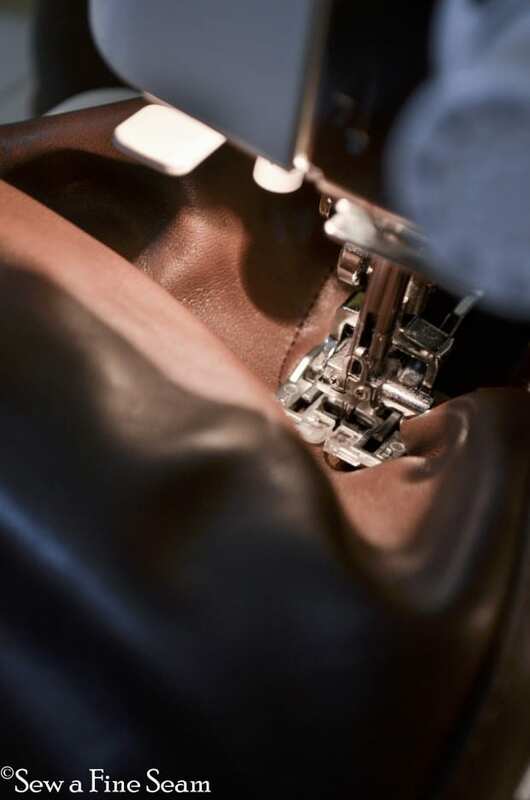 That way when working with the piece in the machine I could tell where the leather was supposed to go as I worked and bunched up the boot sides to make it fit through the machine. Second side was a bit trickier and is not for the faint of heart or a sewing novice. As I worked toward the point on the second side I just had to go very slowly and keep working it through. 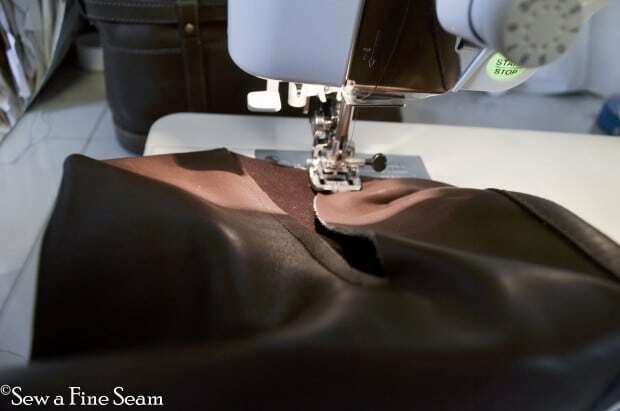 It wasn’t completely perfect – the first seam I sewed wasn’t exactly straight. But since it is to the inside of my leg I decided it wasn’t worth taking that stitching out. 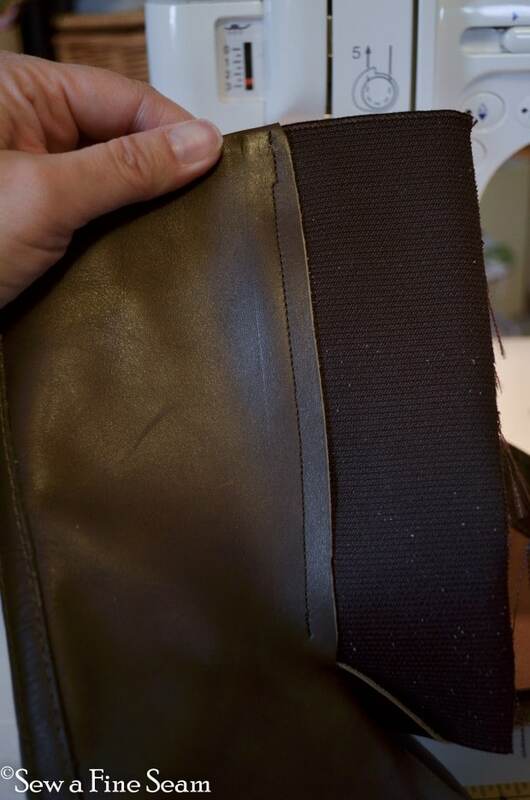 I did have to remove some stitches on one seam because the leather lining on the inside shifted and wasn’t caught in the seam like I wanted it to be. I sewed a straight line (well, as straight as I could!) down both sides of the elastic then i wanted to sew a small seam across the end of the point made by the two seams. 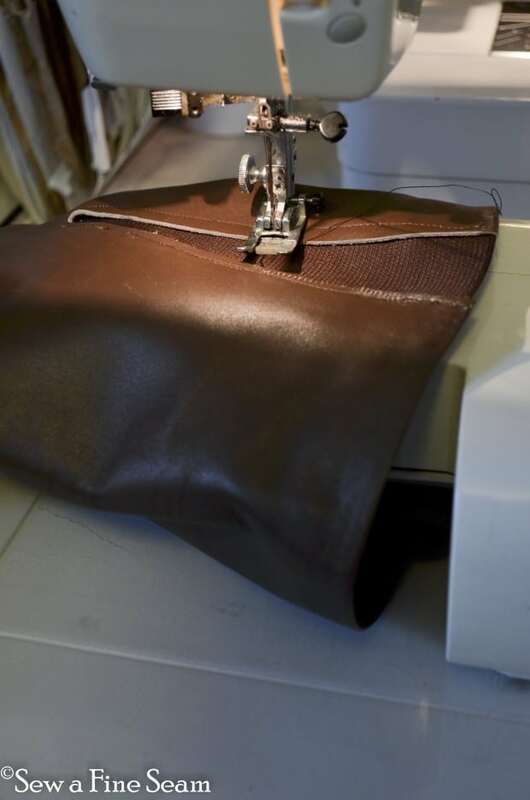 For this I pulled out my old sewing machine – it is smaller and has a detachable part that, when it is removed, makes the arm of the machine much narrower and I was able to slide the boot onto it horizontally to stitch that seam. You can see that small seam here – it still wasn’t very easy to get to it and make that seam but I managed. It won’t win any beauty awards but it works for me! And there you have it. You can see that my seams weren’t perfectly straight and the small seam at the bottom of the point is rather a mess. I wanted to stitch it more than once for extra strength and I got the job done even if it’s not the most beautiful thing I’ve ever sewn. And there they are – my beautiful new boots, altered to fit my chubby legs. I love the color – it’s somewhere between black and brown and grey. They are Coach brand and the color is called Elephant. My husband was very pleased with my purchase of leather boots. And I managed to stay just under the $200 I had said was my top price. I know to a lot of people that is just ridiculous. But we have found that buying quality leather makes them last a long, long time. My black boots that I’ve had for years are leather but not leather lined. I found them at Elder-Beerman at least 5 years ago on sale for $26. I paid less than $20 to get new heal caps put on them this year and I’m still wearing them. These Coach brand boots should last me 10 years or more. And the leather sole means that when it wears out all I have to do is have a new sole put on it. The older I get the more I tend to wear the same boots/shoes, when I find good pairs that fit comfortably. Gone are the days that I bought new, cute, cheap shoes every season. Give me leather that will last for years any day! What do you think? 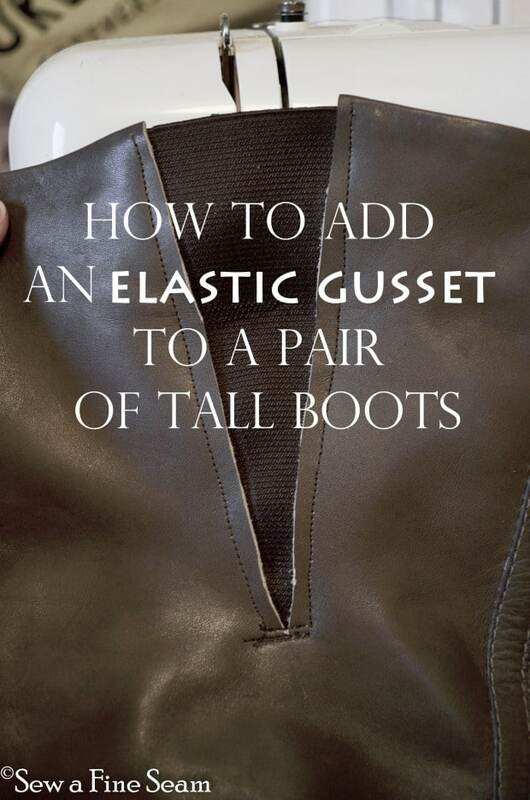 Would you attempt to add an elastic gusset to a pair of leather boots? Do you think I’d be able to do this with canvas? I bought a pair of knee high all stars and my calves are a liiiiiiittle too big. Okay, a lot too big 🙁 I am SO disappointed and I wanted to see if anyone out there had any options! I would like to hire u. How much would u charge and how do i get ur contact info.? I too am a big believer in buying quality. My two $100 handbags are STILL going strong after 3 years. 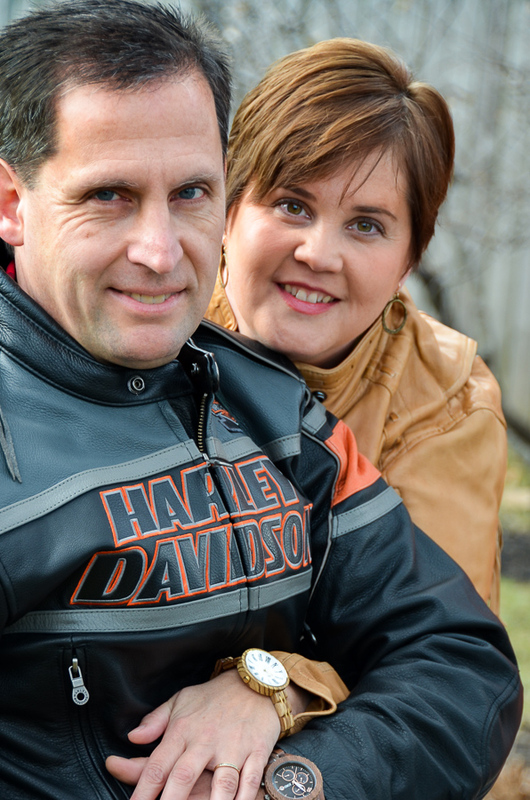 I never thought that much about leather being better till I married my husband – but he is so right! More comfortable, better for you and lasts so much longer! Very nicely done! I would have been a wreck making the first cut on that beautiful leather. I’m curious, what kind of thread did you use? Great idea to add the gusset! I certainly wouldn’t do it, but only because I can’t sew anything more difficult than a button on a garment, but I would hire someone to do it in a heartbeat! As for the amount… that’s a personal choice. I definitely prefer quality shoes over cheap ones, but $200 is a bit pricey for me. The boots I have are more in the $80-$100 range. Those are some very classy boots. I’m so glad you bought them for yourself. I know “Moms” don’t often splurge on themselves. I know you are so deserving !! Hope you enjoy wearing them ! I do like that you were able to alter the boots to fit you and were able to do it yourself. I noticed the cut edge of the leather looked a little light, maybe you could use a soft cloth and some shoe polish or a crayon. Nice job and I can see you will enjoy wearing the boots of years to come. bravo. I would bet you have added some color to the edges of the cut. 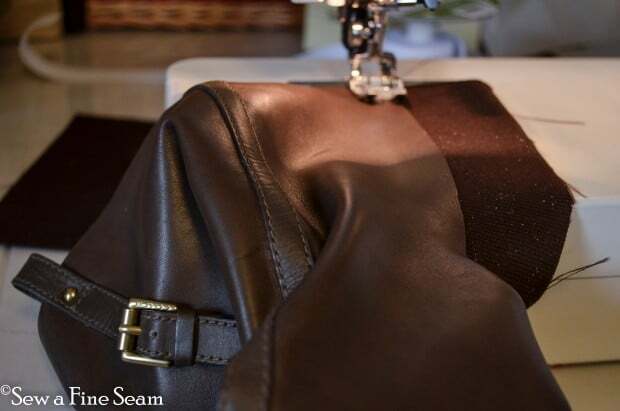 you have displayed that good old buckeye ingenuity.
. if you look at other leather pieces, I would say that your application could stand up to any of the best. you got skills 🙂 that’s a great idea. You are one smart gal but think I’ve told you that before. I’d have been terrified cutting into quality leather boots but you did it girl, good for you. Glad for you to be able to buy good boots that will last many years, they’re very nice looking boots, love the style. When I buy boots I always have to buy ones that have some kind of gusset in them or can’t get boots over my fat left leg (from lymphe dema). Depending on how swollen it is from day to day, (if I’ve been on my feet alot)I can hardly get my foot into my BearPaw boots and they are so comfy. Love those boots, wearing them now as it gets pretty cold in my craft room at night. I’d love to get a pair of higher ones to keep legs warmer. That is a clever idea! You are a brave girl to try this! I would have been so afraid of screwing up my boots. You go, girl! Thanks Trina! I was a bit worried when I went to actually cut the leather but I figured I could surely figure out a way to make it work – somehow! I’m glad I went for it! So glad to see this. I am going to try out on a pair of stretchy pleather boots and I just happened to find some stretch pleather in the fabric dept. that matches. If it works for me I just may tackle that too small shaft on those leather boots sitting in my closet for past 2 years. Best of luck on this Karen! A bit of patience and effort and you can at last wear those awesome boots! A new reader here. How wide is the elastic panel you used? 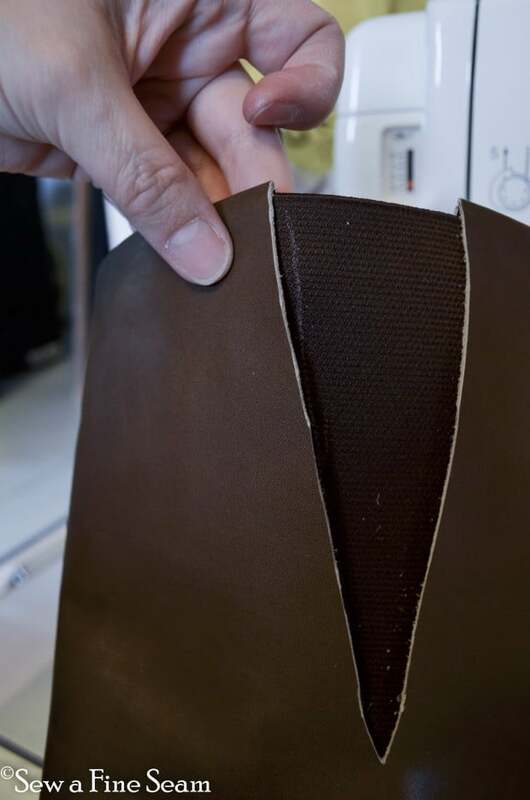 I can find elastic panels online that are 6″ wide and am wondering if that is close to the size of the one you bought from the shoe repair shop. I don’t mean the width across the top, I mean the up & down width..the non-stretchy dimension. Tara, I think it was about six inches. Wow! Wish I had seen this before I returned a pair of boots to Macy’s that didn’t fit right in the calf. Might be worth a try next time Ellen! You are AWESOME!!! I was thinking to do the same thing and was searching for ways to bring my idea to life-and here it is. Thanks for the detail description on the process. And although I can’t sew I’m going to try it. My boots are also wide calf coach, that could come up a little higher on the calf because I don’t like to slouch around the ankle. If I could I would send them to you, but since I can’t I’m going to give it a try; as soon as I find some gussets. Even though your “boot” post has been out there for a while, I just saw it. I have always had issues with finding boots that fit and won’t even begin to tell you how many I’ve bought and returned . I found and ordered a (really comfy in the foot bead) pair of Aerosoles at a great price. Unfortunately, they are too tight in the calf. Also, this brand adds a second zipper to add 1.5″ for large calves—they are still tight on me, even unzipped. Plus, I do not like the look of having the second zipper open. I was thinking about removing the second zipper and replacing it with a strip of leather when I saw your post. Now I’m thinking the gusset may work better-more flexibility. I am having trouble locating the gusset elastic. I found one site but there is a minimum purchase. I don’t need that much. Any ides on where I can purchase some gusset will be appreciated. (Shoe repairs stores are few around here and not willing to help). Best wishes and nice job! I have a pair of English boots I wore riding in the late 70s when I was a kid. I just dug them up in my grandparent’s basement. I definitely would fit them if I could get my calves into them…So…I too had the idea you had about the added elastic on the insides of the boots. These are stiff leather tall boots. I can’t sew them…What’s your address? lol Actually, I will take them to my local guy if I can, but the owner changed and I am not sure I will like the new guy. So, yeah..Where will I send them, and what do you charge? 🙂 Thanks for proving my theory! If I can get this done, I will also add rubber soles to the leather that is already there. 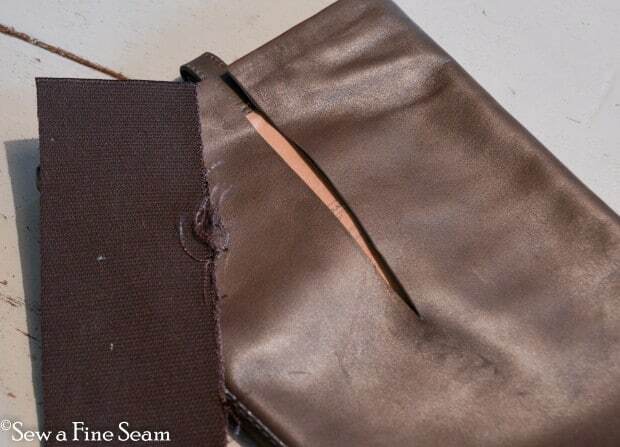 If you stitch both sides of where you are going to cut, and then cut, it holds the lining and everything together. Then, cut between the stitches. Finally, sew in your elastic. It’s a bit easier. I just have one question if anyone can answer it. How much stretch do you get with the goring material? I’ve found the goring on Amazon and Ebay by the yard but I need to know how much stretch is in it because I’ve found some boots with various widths of the goring in them already. I just need to know how much give the goring has? 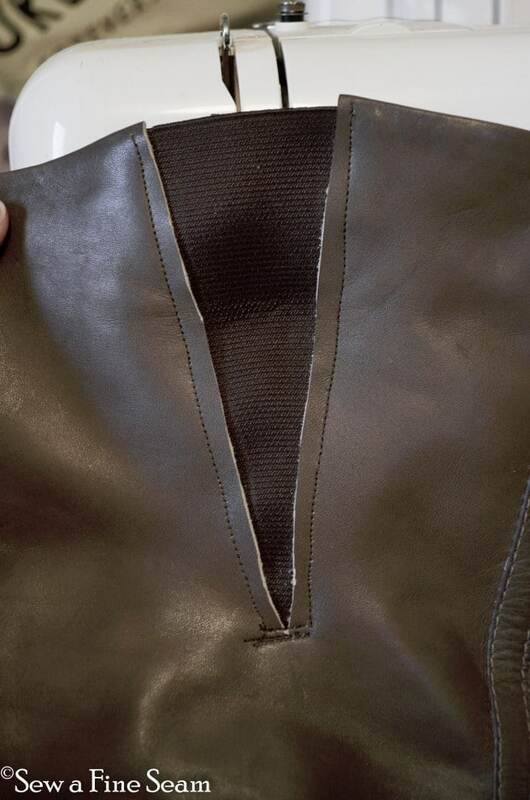 How would you suggest adding a gusset next to a zipper? 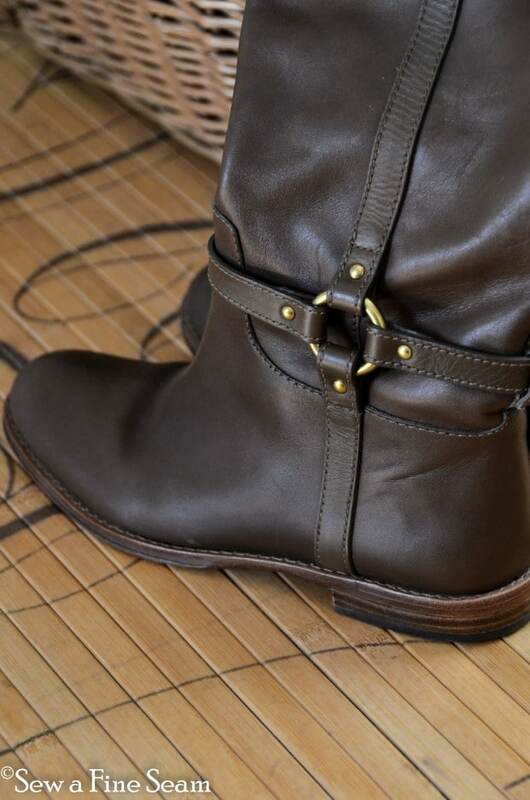 You did a terrific job on your boots and explaining the process. I had a few question as I would like to try this on my own boots. 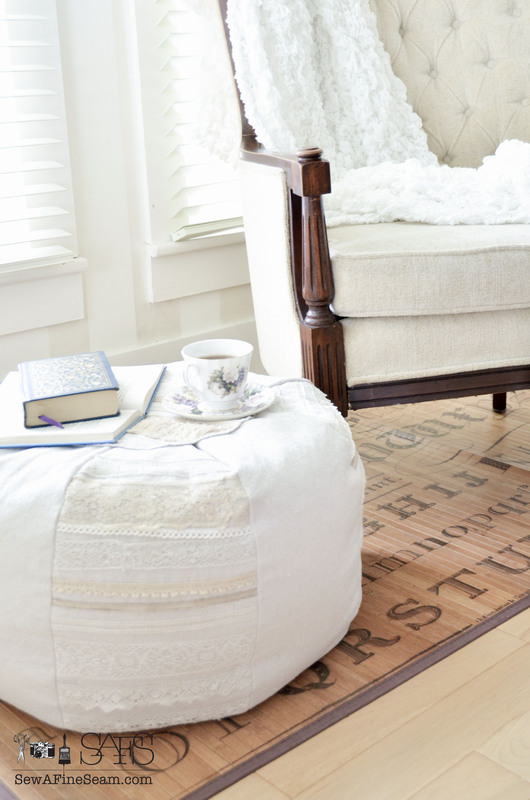 Did you use a normal sewing machine for this project? 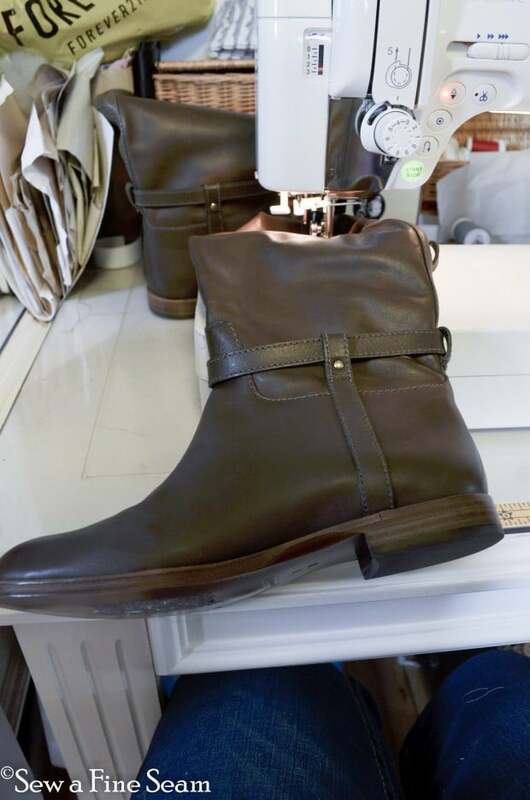 I have leather boots with a winter lining and am wondering if the needle would make it through.